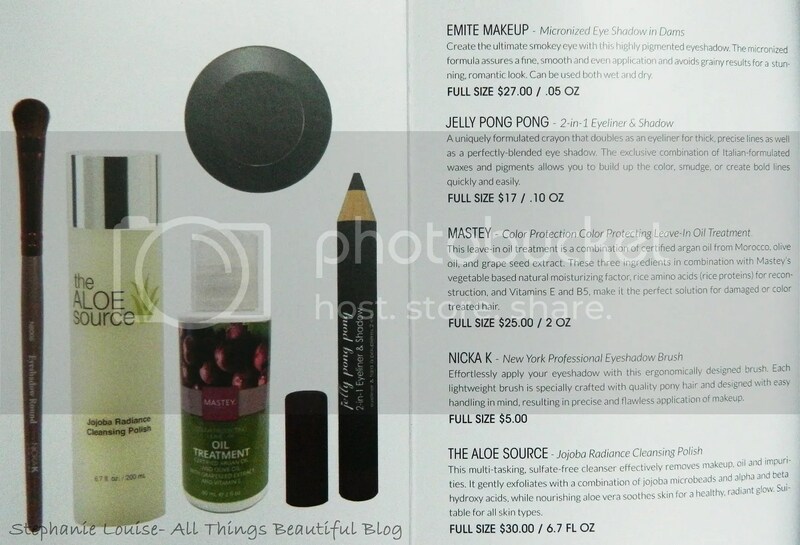 Glossybox Holiday Romance for November 2013 featuring Emite Makeup, Mastey, & More! Glossybox is here! Woohoo! This box has some makeup, a tool, hair care, & a skincare product. 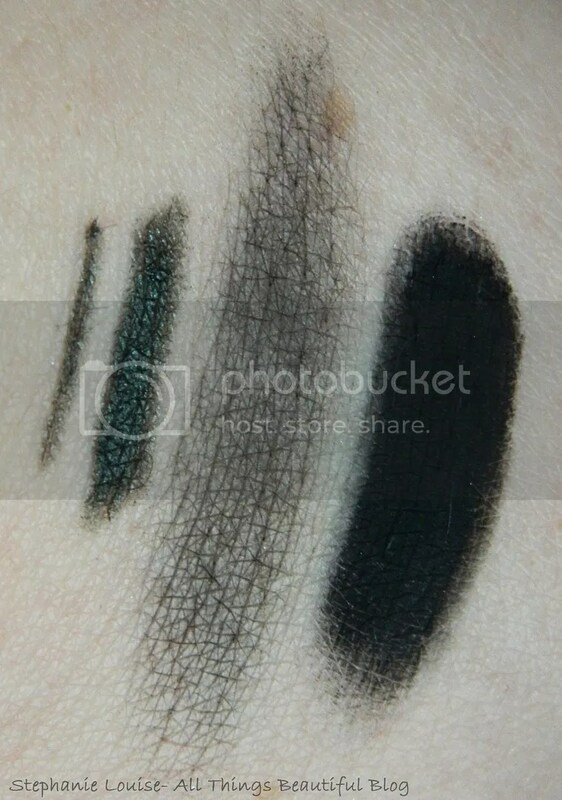 I have swatches & mini reviews below… & I might have found my very blackest eyeshadow ever! Please enjoy my thoughts below! Here’s the card for this month with the card info & such. I also received another card (pictured below) that offered 20% off your first purchase from Mastey with the code GLOSSYBOX. Shhhh don’t tell them I told you okay?These boxes are awesome (I’ve been storing everything from pictures to Christmas gifts in them!) along with some crinkle worms which Sawyer (our kitten) absolutely appreciates. Emite Makeup Micronized Eye Shadow in Dams– This eyeshadow is ridiculously black! I mean, to a crazy degree! I swatched it below with the brush provided & then on my finger as well. SO black & SO pigmented! I haven’t compared my black eyeshadows in a long time…I might need to do that again soon! 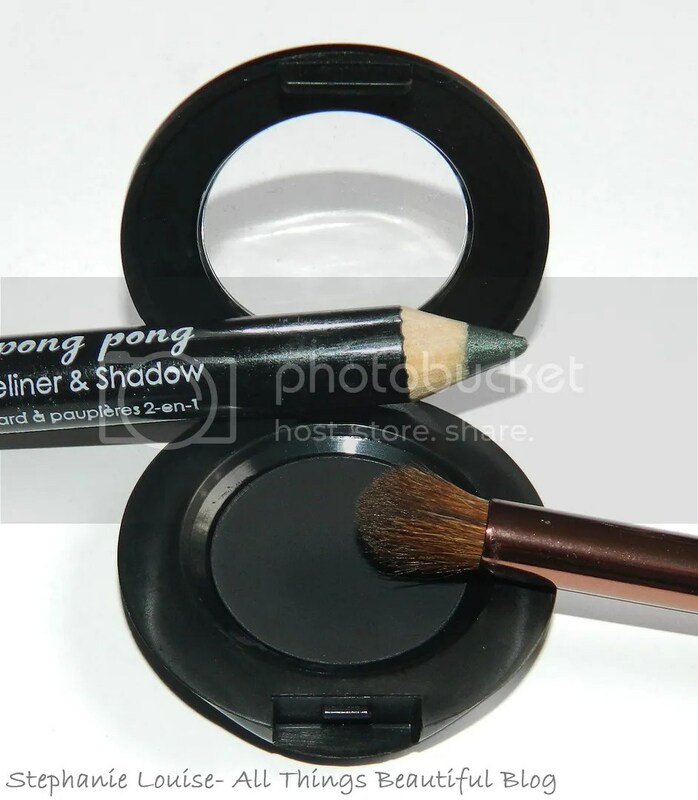 Jelly Pong Pong 2 in 1 Eyeliner & Shadow Pencil– I’m a bit confused with this pencil…I have no idea what shade it is! I can’t find it on the pencil anywhere & I doubt the only shade they have is this deep green? Either way, it is really pretty & will make a lovely eyeshadow base! Love the shimmer & smoky look to it. Mastey Color Protection Color Protecting Leave-In Oil Treatment– This is a nice big sample, 2 fl oz of oil! I don’t love the packaging of this sample, I definitely appreciate having a glass bottle with a dropper now! No big deal because this is a sample but just something to note! This smells SO good & somewhat floral. Nicka K New York Professional Eyeshadow Brush– This is a blending eyeshadow brush from a brand I’ve never tried before, thanks Glossybox for something out of the norm! I personally like boxes that include a variety of brands I already love & new brands to check out. Anyway, this is a really lightweight brush made of “quality pony hair”. I don’t know if I’ve ever had a pong hair brush before but it is really soft but still has the perfect density to pick up eyeshadow & actually blend into the crease. The Aloe Source Jojoba Radiance Cleansing Polish-This is a sulfate-free cleanser that is supposed to remove makeup, oil, & impurities. On top of that it has jojoba microbeads & alpha & beta hydroxy acids to exfoliate. It promises to nourish & soothe skin with aloe vera & says it is suitable for all skin types. It smells like a regular cleanser & looks like a clear gel with white micro beads in it. Here are the swatches! On the left is the very finest line I could get next to a thicker line of the Jelly Pong Pong 2-in-1 Eyeliner. Next to that is a quick swipe of the Emite Micronized Eyeshadow in Dams using the brush & then a swipe using my full finger. Look how black it is right? If you’re interested in signing up for Glossybox USA it is a monthly subscription service for only $21 a month. I have posted lots of reviews so check them out for reference! I liked this box, definitely some fun new items to play with including some full sizes! Do you receive Glossybox? What did you get this month? Glossybox for November 2012 featuring Illamasqua, Kryolan, & More! Glossybox USA August 2013 featuring Guess, Sue Devitt, & More! 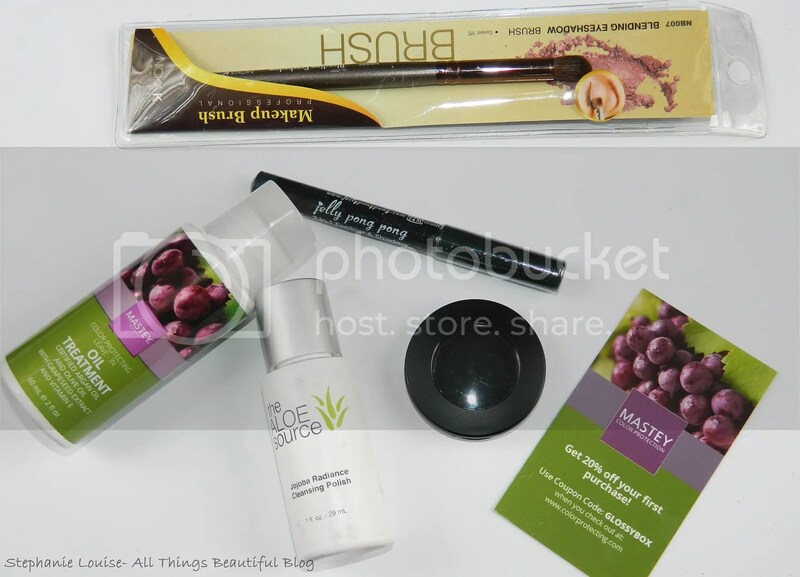 Glossybox October 2013 by Byrdie featuring Tarte, Fresh, & More! 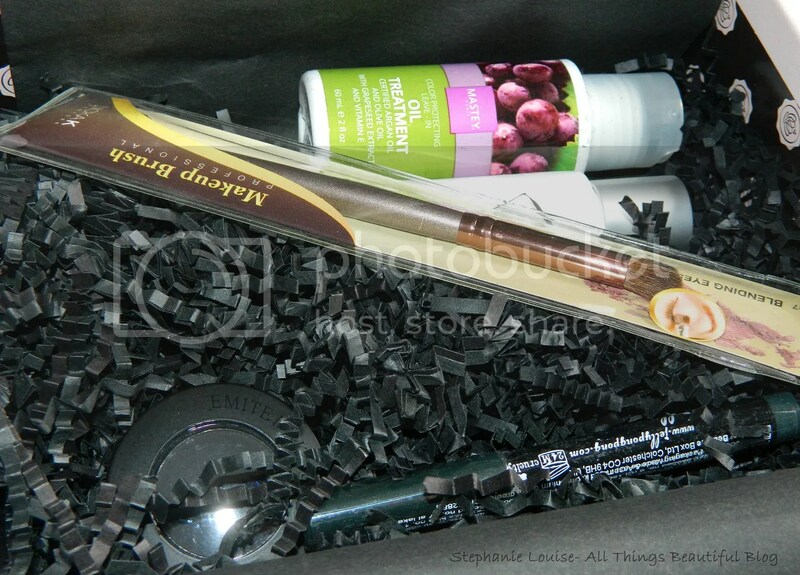 Glossybox for May 2013 featuring Xtreme Lashes, Nicka K NY, & More!